The BriarGate resthome places top priority on helping residents to remain as active, occupied, fulfilled and as independent as their circumstances allow. Our comprehensive Diversional Therapy and activities programme are devised and managed by a Registered Occupational Therapist. On admission to BriarGate, each resident is assessed for the purposes of developing a personalised “activities plan” to suit the individual’s abilities and needs. Activities are planned and structured to stimulate both the body and the mind. So, along with TV-viewing and Video requests, Daily Newspapers are Read to Residents, discussions on articles read; regular quiz sessions; poetry reading and discussions; table and floor games. 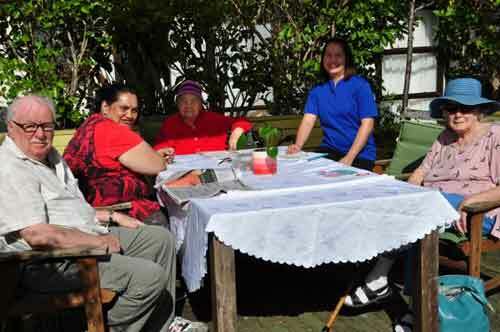 BriarGate Activities Programmes are a Cornerstone of our Care Philosophy for the Elderly. There’s Music, Singing and Dancing, Plus Regular Visits by Local Musicians and Entertainers. Physical activities include targeted-achievement Exercise Programmes, Sensory Stimulation, Ball Therapy, Balloon Tennis and walks once or twice a day. BriarGate operates its own 10-seater mini-bus, which is used to take Residents on Group Outings to Shops, Parks, Beaches, Museums, Sights, etc. Resident's and guest's birthdays are celebrated, and every year BriarGate invites family and friends to join their loved ones at a Pre Christmas party with festive fare, enjoyable entertainment and thoughtful gifts for all residents. BriarGate Offers Specialist Residential Dementia Care in Anne McLean Drive, Glenfield, Auckland's North Shore. Choosing specialist residential accommodation for someone who requires dementia care is an important decision. Dementia, in all its forms and stages, calls for specialist care by expert staff. Families need to know that their loved ones will be looked after with skill, compassion and respect for personal dignity. 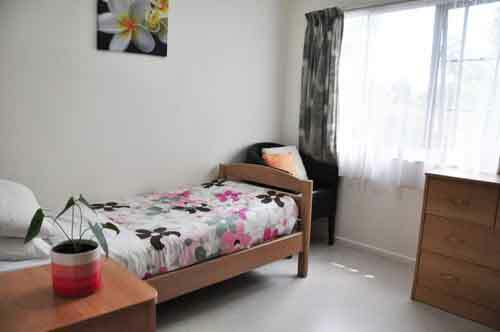 BriarGate is a 40 bedrooms facility that is unique in the Auckland region for its ability to deliver a complete range of dementia care conditions and services. Purpose-built in 1988 and recently upgraded to a high standard, BriarGate is a very secure and welcoming suburban home, nestled in a spacious camellia garden, close to the Glenfield shopping centre. Nearby are the Northern Motorway, Wairau and Glenfield Roads, and the Upper Harbour Expressway. This convenient location is easily accessible by car to family members and friends who reside in the North Shore and Upper Harbour areas, and is also within short walking distance of regular bus services. Residents enjoy the personality and privacy of their own rooms with individual bathroom/toilet amenities. Communal and relaxation amenities include two comfortable lounges, courtyard garden and sunny conservatory. BriarGate features hygienic, well-equipped kitchens and dedicated dining areas. Our trained cooks prepare varied, healthy and nutritious menus of meals and snacks. Residents may choose to eat breakfast in their own rooms, on the deck or patio, or with staff and other residents in the dining room. The BriarGate team has specialised training and is experienced in the demanding but rewarding care of men and women who suffer from dementia. Training is formal requiring study and examinations. Plus regular attendance at seminars and practical in the workplace learning. Our General Manager and Registered Nurse lead the caregiver team, and contracted local doctors experienced in the medical care of persons with dementia attend BriarGate residents weekly, while also being on-call for emergency situations. After hours critical needs are handled by North Shore Public Hospital. BriarGate’s core philosophy is to assure the physical and psychological health necessary for the well-being, comfort and happiness of all dementia residents. We strive to fulfill this commitment by providing fully compliant, high-quality facilities, amenities and services that are operated and provided by highly qualified, experienced people who really care. Family members and friends are always welcome to visit residents, have a cup of tea with the staff and get an update on a resident’s condition and progress. We welcome enquiries on behalf of permanent residents, or for short-term (respite / carer support) and day care admission. We design a specific activities program for each resident that includes particular preferences, one-one sessions and group activities. Residents enjoy frequent outings with staff in the BriarGate vehicles. Beaches, parks and the nearby shopping mall are popular destinations. Our elderly residents enjoy a high standard of everyday residential and visiting medical care and convenient access to community healthcare facilities and services. Our location places residents within quick and easy reach of North Shore hospital, Accident & Emergency clinics, testing laboratories, doctors’ and specialists’ offices, social and ambulance services. The BriarGate caregiving team includes our Manager and a Registered Nurse, who are on the premises daily and on-call 24/7. In addition, BriarGate has two contracted, local General Practice doctors, who are available to attend residents on a weekly basis. Pharmaceuticals are dispensed from personalised pre-packs to ensure residents receive the medicines prescribed to them. Medical situations requiring urgent, specialized treatment are handled by the the A&E Departments of the local District Health Board hospitals. Residents are also welcome to choose, or continue to be treated by their own doctors. The only condition is that a senior member of our staff must be present during any consultation, in order to maintain awareness of every resident’s state of health, treatment protocol and particular needs.